While I would like to say that I’m able to stretch the 24 hours in a day to fit in time to read EVERY DAY (which is one of the pieces of advice I don’t think I could ever give, much as I’d love to do it myself), I do try to make time to fit some reading every day. This is hard because, like any professor, I have to deal with meetings, answering emails, reviewing books and journal manuscripts, doing my own academic writing, and every other thing that comes up. As Melonie Fullick aptly puts it, it’s harder and harder to find time for deep reflection. First, I commit to writing a full paper. That is, I don’t attend a conference unless I am writing a full paper that I then will upgrade with the commentary and critique I receive and submit to a peer-reviewed journal. I have now built a workflow and process where I write my priorities as a list and then I note besides them a “check mark” when they’ve been completed. I also wrote the mantra “submit, submit, submit” to motivate me to NOT keep a paper with me for long, but just submit it for peer-review. 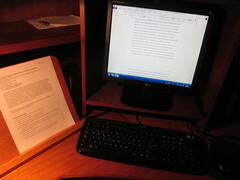 Second, I write a literature review for each paper. This means that I go back to the graduate school method of highlighting journal articles with pens, writing notes about the literature by hand, on paper. 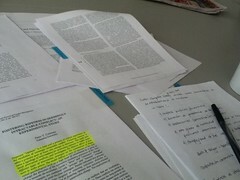 Of course, I also use Evernote to clip relevant research tidbits and articles, and I annotate PDFs on Mendeley. And I have a modified method of computerized note-taking that vaguely resembles the Cornell Notes method (though mine is much more thorough). Writing a literature review for each paper I publish forces me to go back to the body of scholarship, and to budget enough time to read whatever works I have visualized including in my paper. Knowing that I have 25 papers on a specific topic to read, summarize them, write notes on each, makes me be way more efficient about how I use my time (and often forces me to block even more time to just read). Finding the time to think deeply and reflect (one of the tenets of academic life) is not a problem only for academics. Other busy folks find creative ways to think and reflect (read here, and here for but two examples). I also find that getting away from the city where my university is located every weekend (I visit my parents in their hometown) also gives me time to think and reflect. Since many times I bus instead of driving down, I use those two hours to read and reflect on what scholarship I’m working on. Finally, another way in which I have found time to reflect and think is by going on long walks with friends, be them academics or otherwise. 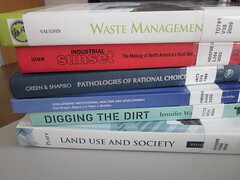 By verbalizing what I am working on, I am forced to think deeply about the direction in which my research is going. 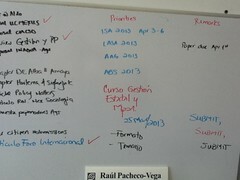 Tagged with literature review, process, research, workflow. great post, great tips. I do try to read every day, but writing every day is a goal I am going to work towards!